1) DIY 3D-printed Electric Motor. INFO: This project showcases a 3D printed brushless motor in which the motor coils are deposited on a PCB (Printed Circuit Board). With the current design the static torque was measured to be 0.9 gram-centimeters - not enough to include those motors in a tiny quadrotor just yet but we are very keen to see where the author takes this project in the future. 2) Humble Book Bundle - Machine Learning. INFO: Humble Bundle teamed up with O’Reilly for the Machine Learning bundle. You can grab up to 15 books and support Code for America. Before checkout you can select how you want your money to be distributed between HumbleBundle, O’Reilly and Code for America. The bundle ends on 10.09.2018. INFO: Johnny-Five is a Robotics and IoT platform working with Arduino compatible boards. It seems perfect for people who want to start their adventure with Arduino and have web development background. In the Examples you can find anything from blinking LED to handling joysticks, servos, motor shields, IMUs etc. Most of the examples have a very clear images showing the wiring between Arduino and hardware, which should also help if you are a beginner. 4) MIT researchers take a step forwards in water-air communications. INFO: MIT researches propose a system where a sonar submerged in water directs the signal to the surface, causing tiny vibrations that represent transmitted bits. Above the surface a highly sensitive receiver reads the disturbances and decodes the signal. The emitter sends sonar waves at different frequencies (e.g. 100Hz for 0 and 200Hz for 1), causing tiny ripples in water. The receiver is a high-frequency radar that processes signals in the millimeter wave spectrum of wireless transmission, between 30 and 300 gigahertz. 5) Waymo’s left turns frustrate drivers. INFO: According to author’s sources some people are getting frustrated with driving patterns of autonomous Waymo vans. Author mentions that the reason cars are timid is not caused by the technology (Waymo cars are equipped high resolution LiDAR sensor that can have 200+ meters) but by the teams avoiding risks at early stages. INFO: Did you know that NASA’s Curiosity has roughly the size of a car (10x9x7 feet or 3x2.7x2.2 meters with a mass of 1,982 pounds or 899 kg). This interactive website allows for looking at the rover from different perspectives and provide information on the rover subsystems. 7) towr - Trajectory Optimizer for Walking Robots. INFO: towr is a ROS package for trajectory optimization for legged robots. The library includes an Rviz (ROS visualization software) plugin that allows for creating robot representation and visualizing gait (see section two in the repository documentation for the short presentation). If you want to build your own AT-AT you can probably start here. 1) ViSP - an open source visual servoing platform library. INFO: ViSP (Visual Servoing Platform) helps in developing robotics control systems in which visual tracking is at the heart of the project. ViSP team youtube channel is full of videos with interesting applications (top picks: 1, 2). It’s also worth noting a very well managed project documentation. 2) DonkeyCar - DIY self driving platform. INFO: The project uses off the shelf R/C car that you can modify (add a camera, print 3D parts, program a Raspberry Pi). The project is fully open source and there is a very supportive community maintaining it. Here is a video showing an autonomous donkey race in action. INFO: DARPA is organizing a Subterranean Challenge aiming to explore technologies to map, navigate and search underground environments. The final event will take place in 2021 and the finalist will take a $2M USD price. 4) Caltech engineers herd birds with a drone. INFO: The engineers developed an algorithm aiming at making passenger aircrafts takeoffs and landings safer by positioning a with respect to the flock of birds in such way that the whole flock changes the course. Interestingly, during operation the drone has to stay at just the right distance from the flock, if it comes too close the flock will scatter. You can find the full paper here. 5) PythonRobotics - repository with robotics algorithms. Written in Python. seems to contain all the source files needed to replicate the results, making it a great learning resource. If you find this resource helpful please consider supporting the author. 6) European Space Agency (ESA) is looking for ideas for new space transportation services. INFO: ESA is offering feedback on concepts for new commercial space transportation services. The ideas have to be sound, commercially viable and complement existing ESA space transportation programmes and activities. Three outstanding entries received before 14th of September 2018 will win a trip to Europe’s Spaceport in French Guiana to see a launch. 7) Paper of the week - ROS: an open-source Robot Operating System (2009). is probably the best place to start. You will also need a computer (or a virtual machine) running Ubuntu or Debian. 1) FLIR, the manufacturer of thermal imaging cameras, offers a free dataset for ADAS (autonomous driver-assistance systems) convolutional neural networks training. The web page below contains a form that you can fill to request the dataset. INFO: The dataset contains over 14k images (60% of data captured during the day and 40% during night). Over 10k of captured frames are annotated. 2) NASA Jet Propulsion Laboratory published an open source mars rover project on github. INFO: The project is based almost entirely on consumer off the shelf (COTS) parts. The total cost of all the parts is under 2500 USD. The team estimates a minimum of 200 man hours is needed to complete the project. It’s worth to point out high quality of documentation in the project (for example Ackermann steering is presented in a very straightforward way). 3) Airbus Zephyr High Altitude (high altitude pseudo satellite fixed wing aircraft) completed it’s maiden flight by staying in the air for 25 days 23 hours and 57 minutes. INFO: Zephyr is an electric-solar plane with a wingspan of 25 meters (82 feet) and weight of only 75 kg (165 pounds). The plane operates in stratosphere with an average altitude of 21 km (70,000 feet). Here you can see the Zephyr launch. 4) Disney created a robotic stuntman. INFO: Here you can find a paper with stickman - what seems to be the first iteration of this project. The robot uses IMU and a rangefinder for state estimation mid flight and air actuated piston to change it’s moment of inertia. 5) University of Texas has patented a smart skin, aimed at giving collaborative robots more sensitive tactile feeling than humans. INFO: The sensors are made from zinc oxide nanorods, 0.2 micron in diameter and supposedly do not need any external voltage for operation. 6) A great explanation of how Kalman Filter works. INFO: The article relies heavily on visualizations, making it more digestible. 7) ESA astronaut Alexander Gerst commanded a humanoid robot “Rollin’ Justin” live from ISS (International Space Station). The robot was located in Germany. INFO: Rollin’ Justin is a DLR (German Space Center) 200 kg (441 pounds), 1.91 m (6.27 feet) humanoid robot with 51 degrees of freedom. The experiment needs a level of autonomy from the robot. The communication delay is around 800ms therefore the robot needs to operate semi-autonomously. This technology could in the future allow astronauts to be on mars satellites and teleoperating robots that assemble habitats. The robot was using April Tags as means of localization. Couple of times during the experiment robot position estimation was off as it can be observed here: 1, 2. To recover from those issues the robot needs to look at one of many April Tags. 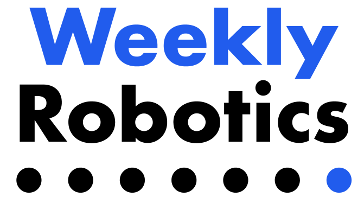 INFO: Thank you for joining us for the first issue of robotics weekly! Your feedback is very valuable to us and we would appreciate if you could fill this 3 minute survey on your expectations from us. Thank you!